One of the reasons that Les Praz is so popular is that it’s one of the sunniest parts of Chamonix to stay. The Chamonix valley widens as it runs North-East towards the Swiss border, and Les Praz is in the flat valley bottom. Even when the days are short, there’s always some sunshine here. For more details about the best time to visit, see our When to Go page for photos of the valley in all four seasons. Being so close to Mont Blanc, the weather, as with any mountain region, can vary wildly. Once you are here, the local weather forecast is very good. The most usual weather pattern is fine, bright mornings that cloud over in the afternoon. Temperature inversions are frequent, so you’ll often find it warmer on the heights than in the valley. These can also bring mists, so it’s worth checking the webcams on foggy mornings – you may find it’s a fine day on the mountain! Another local weather phenomenon is the föhn (or foehn) wind – a warm breeze that blows from the mountain. 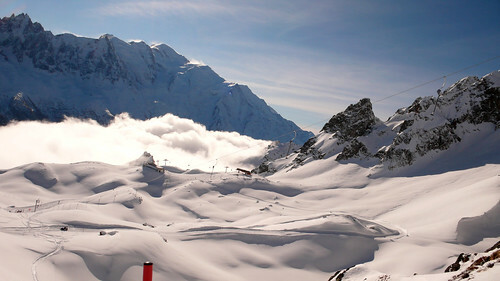 Chamonet also have a page of webcams, so you can check conditions all over Chamonix.